The Altmetric Explorer for Publishers is an easy-to-use web-based platform that enables users to browse and report on all attention data for every piece of scholarly content Altmetric has found attention for. Altmetric collects the relevant discussions around each piece of published research from policy documents, mainstream news outlets, post-publication peer-review forums, social media and blogs, Wikipedia, and online reference managers like Mendeley – then makes it all available to you in one place. Each article is given a score that provides an indicator of the quantity and reach of attention it has received. The score donut visualisation tells you at a glance how much attention has been paid to an article, as well as which sources the mentions have come from. Curious to see how the attention surrounding your published research compares to that of your competitors? 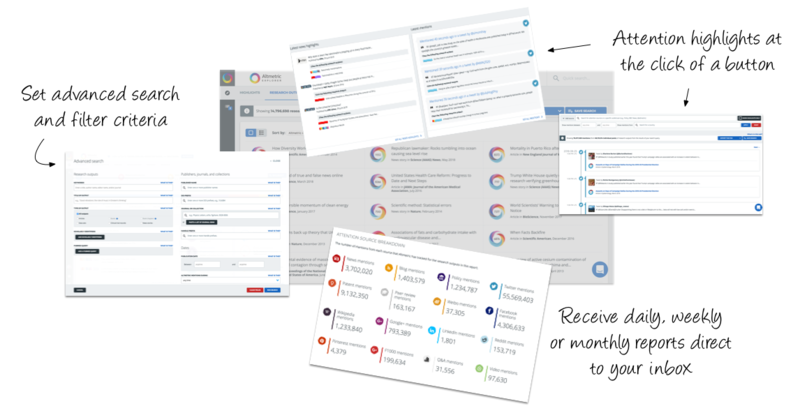 The Explorer includes access to the full Altmetric database – attention data for over 8 million research outputs to date – enabling you to compare and benchmark. Instantly see the demographics for the social network users mentioning each piece of research. Was a study unusually popular in Spain? Amongst doctors? Science communicators? The Explorer can tell you. Our attention data is collated and updated in real time – meaning you start to get feedback on your publications almost as soon as they’re made available online. Set up daily, weekly or monthly email alerts to receive regular updates on the attention surrounding content you care about, delivered straight to your inbox. Quickly and easily gather attention visualizations and data summaries for any search query within the Altmetric Explorer using the Highlights Tab. Browse all articles in the database, or filter by specific journals, publishers, subject area or author affiliation. Enter unique identifiers (including DOIs, ISBNs, PubMed IDs, arXiv IDs and Handles) to track specific items. Alternatively, search for individual outputs using keywords. All of the data in the Explorer can be exported via Excel or an API to be used in other internal reporting or dashboards. How are other publishers using it? The Altmetric Explorer is available on a site license basis, providing easy browsing access for all members of your organisation. Each user also has the option to create an account to set up reporting and alerts.